For information on a similar 2 volume set, Click here. Part 1. 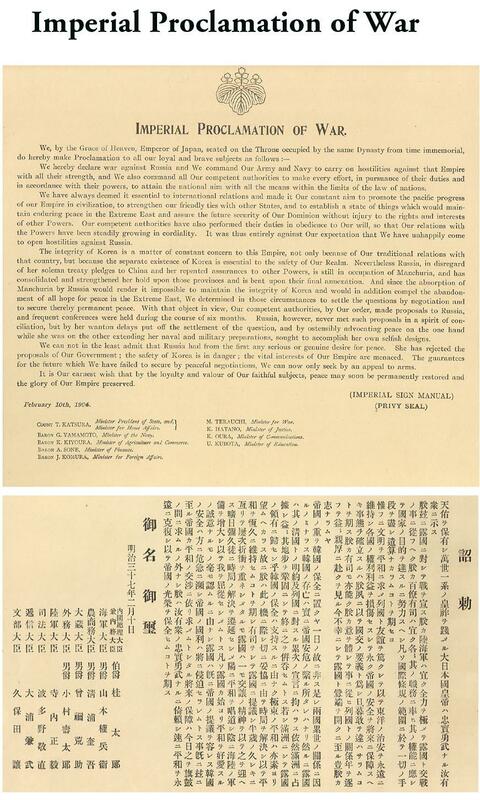 "Operation of the Army of Yalu (The Battle of Mukden)," 12 pages of text in English and 11 pages of Japanese text plus 43 numbered pages of photographs and 10 unnumbered photograph plates. Part 2. 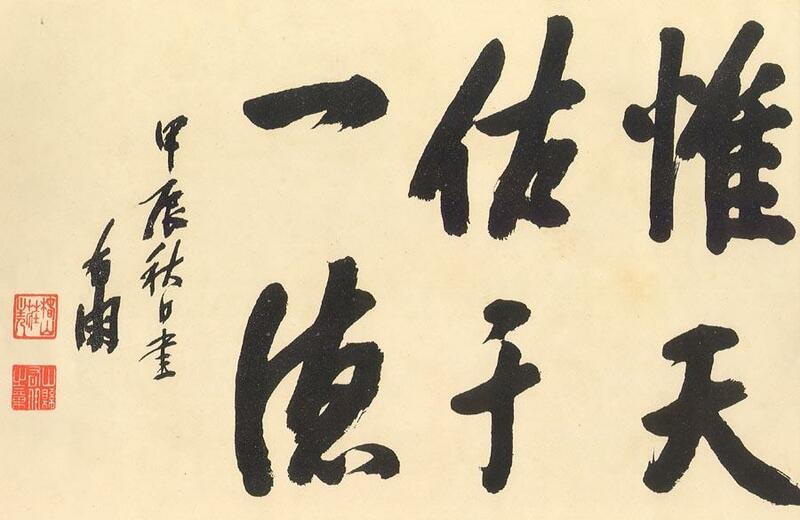 "Karafuto (Saghalien) Expedition)," 3 pages of text in English and 3 pages of Japanese text plus 56 numbered pages of photographs. All plates are black and white halftone photographs. Each plate has an English caption and Japanese descriptive captions and notes. Major Sections of the Engish Text Portion. For information on Kazumasa Ogawa, click here. 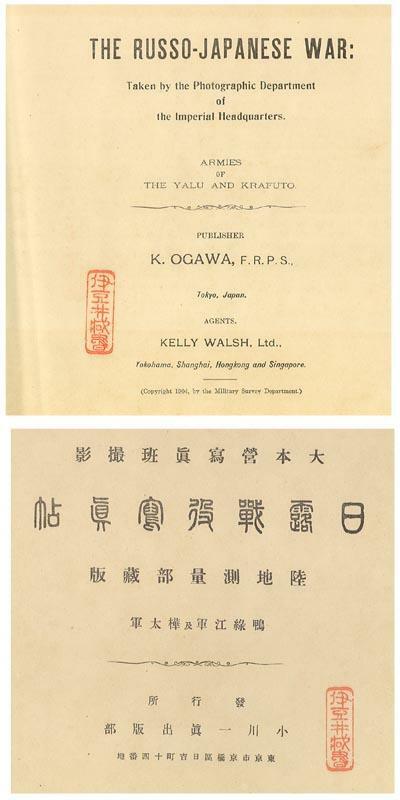 Naval, By Permission of the Naval Department, printed, published and distributed by K. Ogawa, Tokyo, �04, published 1905 (Meiji 38). 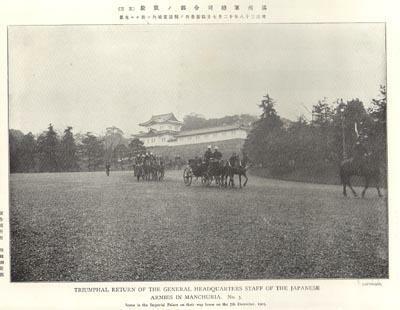 Taken by the Photographic Department of the Imperial Headquarters printed, published and distributed by K. Ogawa, Tokyo, also distributed by Kelly Walsh, Yokohama, Shanghai, Hongkong and Singapore, �04, published 1906 (Meiji 39). A matching set of 6 volumes, printed and distributed in 1905-6, large oblong 4to (14 3/4 x 10 in - 37.5 x 25.5 cm), green blind stamped covers with gilt titles (boards and spine), Tokyo, Naval volume copyrighted by T. Ichioka, 1904, Army volumes copyrighted by the Military Survey Department, 1904. 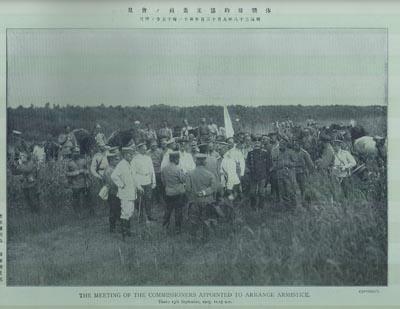 An extensive photographic survey of the War dedicated to the First to Fourth Armies, the Armies of the Yalu and the Karfoto, and the Navy. 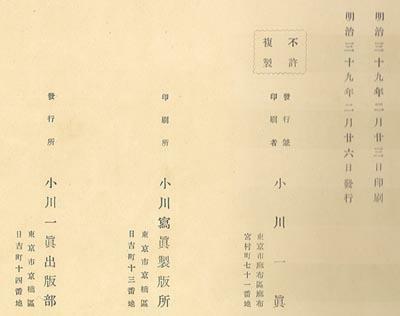 The plates, which have descriptive captions, are supplemented by text pages (in English and Japanese) which reflect official Japanese military reports regarding the operations of the Navy and Armies in the Russo-Japanese War. The text accounts run in chronological order and recount the significant battles, operations and activities. In total the set contains 856 black and white halftone plates (736 - Army & 120 - Navy) produced by K. Ogawa, 136 pages of text in English, 123 pages of text in Japanese. Of the 856 plates, 11 plates fold-out and 14 plates have tissue overlays with descriptive information in Japanese. There is one loose map with the set. All 6 books have the same basic format. When read Western style, from front to back, the front cover is in English. It is followed (all in English) by the title page, the "Imperial Proclamation of War," text pages and finally a listing of plates. The English section ends next to last plate in the book. When read Japanese style, from back to front, the cover is in Japanese. 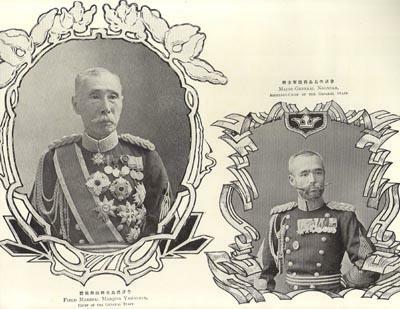 It is followed (all in Japanese) by a title page, portrait plate(s) of Imperial family members in the military and key military members, the "Imperial Proclamation of War," text pages, a listing of plates in Japanese, and the plates with the last plate adjoining the end of the English portion of the book. All plates have descriptive captions in Japanese above the image and in English below the image. Plates in the Army books are numbered and there are plates (plates right after the title page) not included in the numbers. The plates are generally, but not always, printed back to back. The image area is approximately 7 x 10 in. 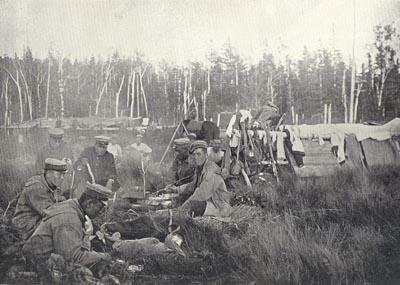 The Army books share common plates (generally 10). 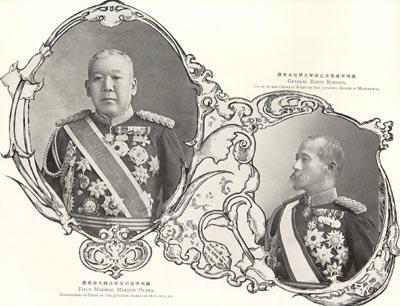 These plates relate to the "Triumphal Return" of the Armies in Manchuria (8 plates at the back of the numbered plates) or they are portraits of commanders (2 plates at the front of the book). It is clear that the books were edited to not present images of horrors of war. I find very few plates that show the actual human carnage or death on the battlefield. In general the images show battles in progress, important locations, key terrain, key figures (both Japanese and enemy), captured ordnance and munitions, troops in combat and at rest, prisoners of war, first aid stations and hospitals, ships and military equipment and an occasional dead horse. A Note Regarding the Plates. Mottling on plates is typical in this set. While the plates do not appear damaged, there are scattered areas where the high gloss of the plate paper is dull rather than shiny. You don't notice this when looking directly down on the image. However, when you view the plates looking across towards a light source, you see scattered areas of mottling/dulling on the glossy off-white plate pages. This appears to be a normal aging process of the glossy paper. The text pages which are not the same high gloss paper do not have the mottling. defence position in its neighbourhood. 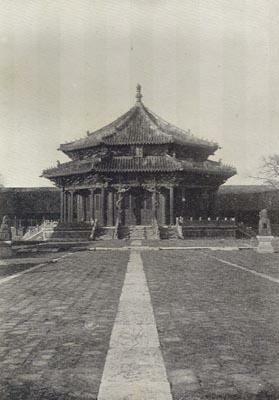 on the southern edge of Huangshalutzu. a fire at Maniulutzu. No. 1.
a fire at Maniulutzu. No. 2. 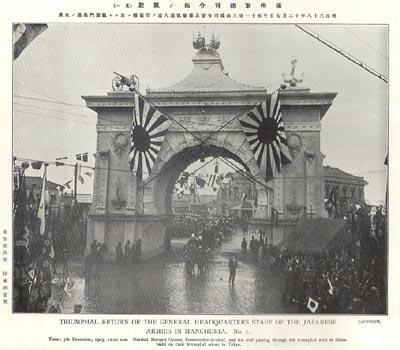 (11)    The South Gate of Fushun. 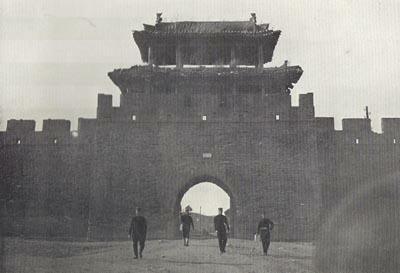 (12)    The Castle-Wall of Fushun. 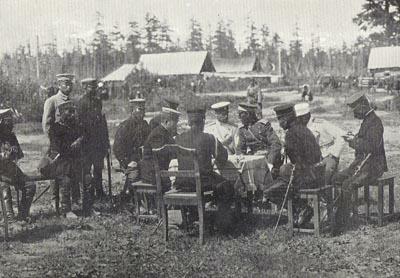 (17)    Army Headquarters at Sanlungyu. 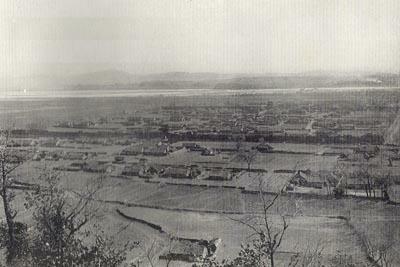 the Hun River south of Fushun-cheng. (26)    Collection of shells seized at Fushun. of the Kaoshan Tower near Fushun. Tower and Russian covered trenches. engineers departments of the Army. Founder of the Manchu Dynasty. (40)    The Inner Sanctuary of the Mausoleum. 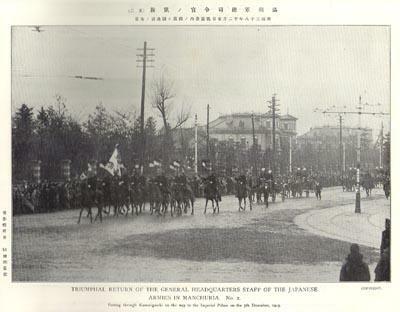 Armies in Manchuria. No 1. 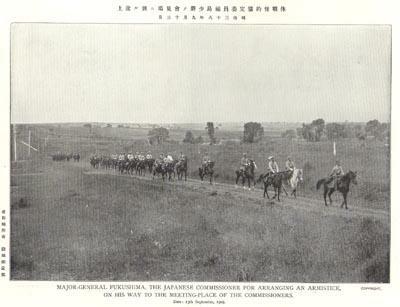 Armies in Manchuria. No 2. 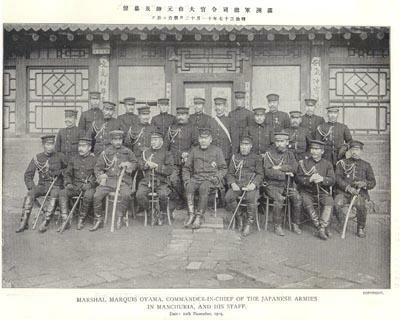 Armies in Manchuria. No 3. 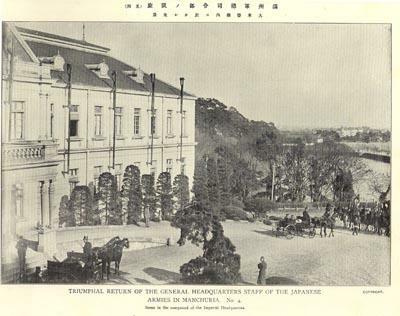 Armies in Manchuria. No 4. 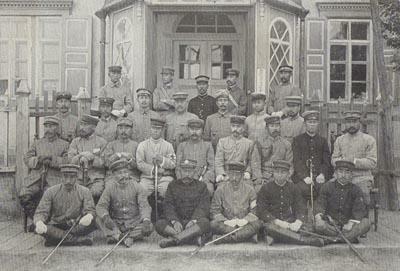 (1) A Division Commander and his staff. 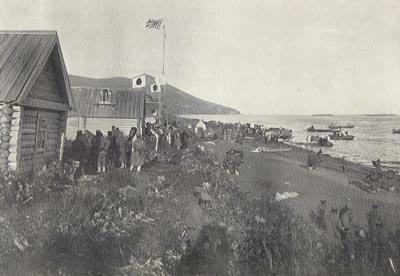 landing of the Naval Brigade. at the village of Mereya. (7) Part of the village of Savinapadi. 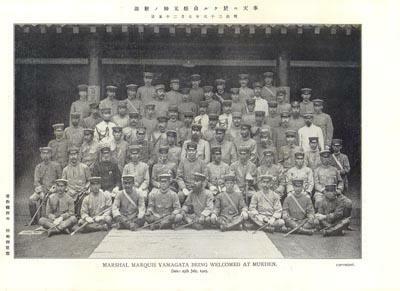 (10) Some of the refugees of Karafuto. (14) The view of the pier of Korsakovsk. (15) A labourer's family at Poroantmari. through the village of Mitriyofka. (22) Part of Vladimirofka. No. 1. (24) Part of Vladimirofka. No. 2.
near the village of Dalineye. (33) Landing at First Alkova on the 25th July. 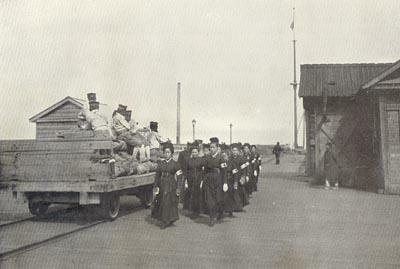 (36) The pier at Alexandrovsk. (39) A church in the town of Alexandrovsk. (40) A colliery near Due. (41) A road over Pilyonsky Hill. (44) A view of the village of Werfnyarm-dan. centre of the village of LuikofF. at the Luikofd Church. No. 1.
the Luikoff Church. No. 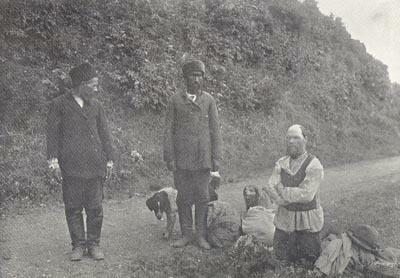 2.
at the village of Tauran. the departure of the troops. First Hamdasa on the 3ist July. (53) Part of the town of Alexandrovsk. 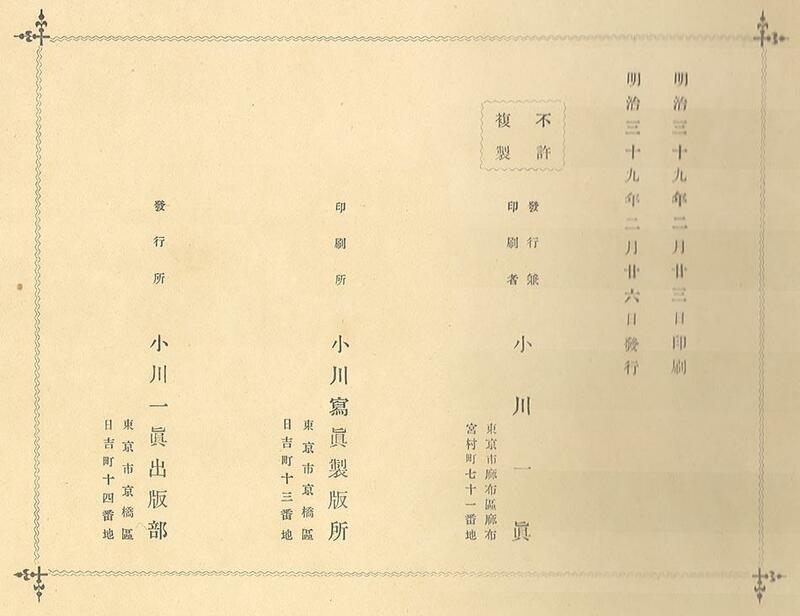 The two rows of characters at the far right indicate the following (going from the right row to the left).